Today, we often take it for granted that ancient texts mentioning linen or leather armour must describe the kind with a yoke over the shoulders and a skirt of ‘feathers’ which we see in Red Figure vase paintings and Etruscan tomb paintings. But like many other aspects of this debate, it is hard to trace back before Peter Connolly in the 1970s. People have collected references to linen and leather armour in literature since the 16th century, but for a long time they did not compare it to artwork any more than they compared it to objects in museums. At first this may have been because travelling to collections of art and accurately reproducing them was impractically expensive. Any scholar could see a collection of antiquities, but the one in their patron’s library was not the one in another scholar’s cathedral or a third’s country house, so they could not refer readers to a specific sculpture and expect that they would seek it out in the way they could cite a line of poetry and expect readers to take down another book and read it. Also, the brighter researchers often noticed that many of these passages describe the armour of barbarians: Egyptians, Assyrians, Iberians. John Kinloch Anderson is the first writer who comes to mind who explicitly identified the “linen and leather armour” he saw in Greek texts with the armour with shoulder flaps in Greek sculptures and paintings (Military Theory and Practice in the Age of Xenophon, 1970, pp. 22-23). About a hundred years before, him, a Prussian staff officer named Max Jähns had some different thoughts on this question. Jähns was writing world history, and his approach reflected this. In his discussion of prehistoric and ethnological warfare, he pondered the history of linen armour and cited Alcaeus and the oracle about the linen-breasted Argives (Anth. Pal. 14,73) as evidence that the quilted gambeson (Steppwams) had been used in early times. The first is the oldest text mentioning linen armour known today, the other is not so strong. The Palatine Anthology was copied in the 10th century and contains a wide variety of material, not all of which is by whom it claims to be by, and just like other people, the Greeks were prone to writing prophecies after the fact. Also, “linen-breasted” is a good Homeric epithet, whereas evidence for linen armour is later than the Iliad is usually thought to have been composed. An early prophet who described warriors as linen-breasted is much more likely to have been using a poetic epithet than describing a kind of armour which had not yet appeared in the Aegean. In this section, Jähns seems to imagine linen armour made from layers of cloth quilted together like the kinds common in Europe, the Islamic world, and India in the last thousand years. In his discussion of Near Eastern warfare (or the Medes, Persians, and peoples of Asia Minor) Jähns cited Herodotus and the usual passages from Xenophon on easterners with linen armour, as well as a Byzantine chronicler who I will talk about another time. However, he also cited artwork: he referred readers to two of his illustrations, and said that the Neo-Assyrian reliefs shows soldiers wearing linen armour in the form of a short, sleeveless jacket. 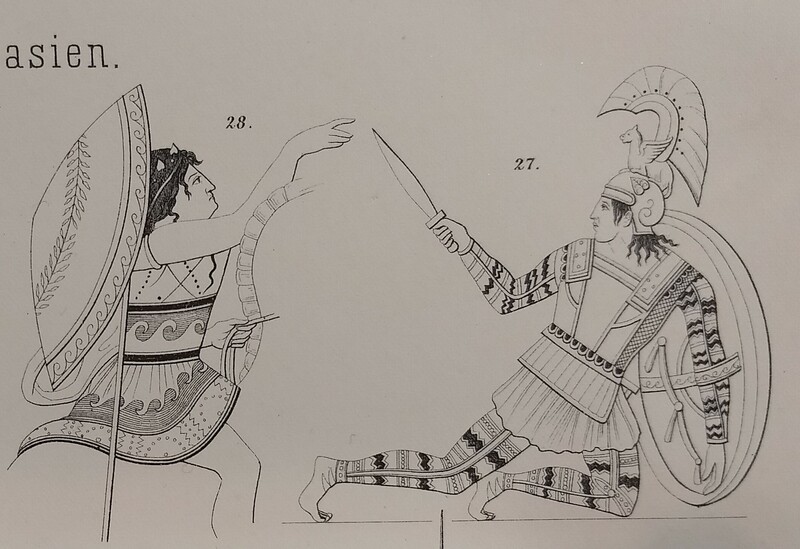 We have those reliefs, and the 19th century drawings which he may have known better than the surviving sculptures, and I don’t know of anyone who interprets them as linen armour today: Neo-Assyrian documents certainly describe armour as bronze or iron but not linen or leather. He cites plates 8 and 10 as relevant to linen armour, and here are some details from them. These two illustrations show the armour which people today often assume was of linen or leather , but Jähns does not say what material he thinks was used. The figure on the left is the grave-stele of Ariston from Attica, I don’t recognize the one on the right. It is not at all clear to me that Jähns identified these kinds of armour with the linen or leather armour in Greek and Latin texts! And like the 20th century antiquarians who saw “leather armour” on Trajan’s column where archaeologists today see tunics or shirts of mail or scale armour with the painted details lost, he saw linen armour on Assyrian reliefs where experts today see something else. Jähns is an intriguing character, a Prussian staff officer (he was even in charge of railroad timetables in 1870!) who thought anthropologically and comparatively. Where a Hans Delbrück started his history of warfare with Marathon on the grounds that Herodotus wrote the oldest detailed story of a battle, and ignored the east from Gautamela to Carrhae because that was not of interest to the medieval scribes who selected which bits of Polybius to save, Jähns understood “military history” as encompassing many more things. I wish he had been clearer about how he thought Taf. 8 and Taf. 10 could educate readers about linen armour, but on first glance he suggests that he interpreted the art differently than Peter Connolly did: he certainly did not take it for granted that the linen armour in Greek and Latin texts was the kind which warriors wear in Red Figure vase paintings. 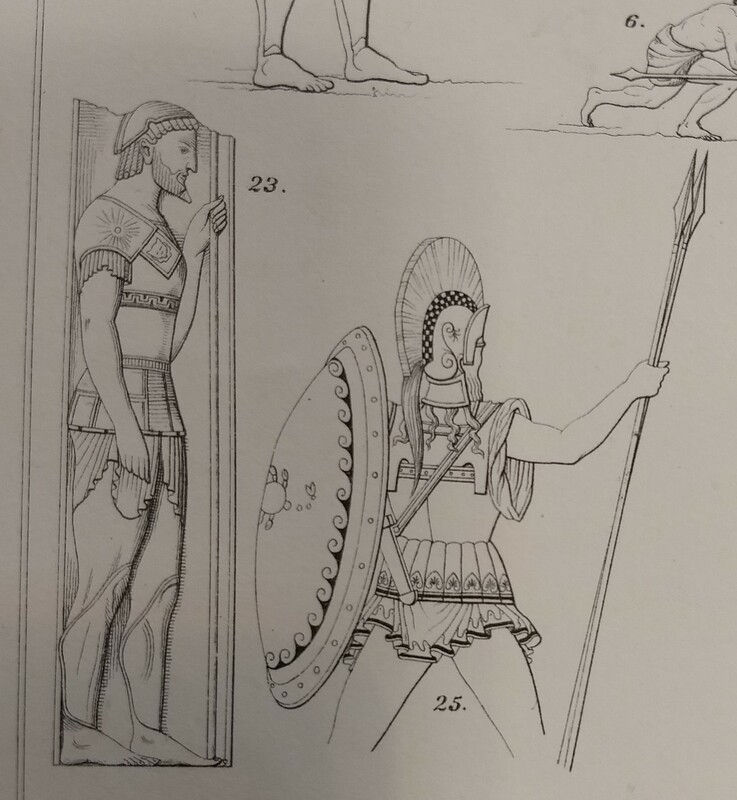 Plate 10 includes the Persians in the Darius Mosaic from Pompeii, and I would like to ask him what he thought their brick-coloured armour was made of and whether he had seen the 5th century vases where easterners wear sleeveless vests with an xxxxx pattern. Today the people who step into these debates are often very interested in arms and armour, and their interest in antiquity was often sparked by artwork and artefacts. They know those sources well. But before the 1970s, almost all the scholars writing on this topic were philologists and historians with flimsy knowledge of preindustrial technology or how to make things with hand tools. Anderson cited Shakespeare’s Henry IV, Part 1 and anecdotes about the battle of Balaclava as helping him understand ancient leather or linen armour, and as an avid horseman, archaeologist, and art historian he was unusually broadly educated for his period. Before the 21st century, most people writing about ancient linen armour knew a lot about Greek and Latin texts, a little about Greek and Roman art, and almost nothing about surviving armour or armour in other cultures. It is not surprising that some of their theories are hard for people who know about those other things to accept.